John Lloyd Cruz gave Angelica Panganiban a Mercedes Benz? 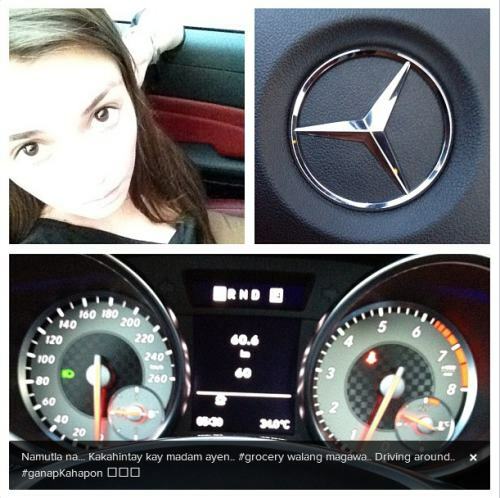 Home » Showbiz » John Lloyd Cruz gave Angelica Panganiban a Mercedes Benz? Though their relationship status is yet unofficial to the public, the rumored boyfriend of Angelica Panganiban, John Lloyd Cruz in a report says gave the latter a P5.1 million worth of a expensive luxury car. A Mercedes Benz SLK is said to have been given by JL to Angel as a gift. It was Angel's instagram followers who started the speculations saying that it was JLC who gave the Benz to Panganiban. An instagram follower named phoebeornotobe said, "Galante ni JLC 5 mil benz delivered last week." Followed by mitchblithe saying, "with matching chocolates and flowers inside the benz car.. sweet papa JL.."
According to pep.ph the Benz is proven new because of the 60.6 KM run read in it's odometer which is also seen in the instagram image posted by Panganiban. Source of the Philippine Entertainment Portal (PEP) said that the speculations made by Angel's Instagram followers are true. The source said that the white Mercedes Benz SLK350 is a gift came from Angel's rumored boyfriend. In a report made by PEP, an information came to them saying that the Mercedes Benz had been baught by Cruz few months ago in a showroom. The report even says that it was paid in cash. The source also told PEP.ph site that Cruz ask that the car be brought to his home. Source even told them that it was Cruz who personally inspect the car and even put a flowers and chocolate before delivering it to Panganiban's house. Comments or suggestions about "John Lloyd Cruz gave Angelica Panganiban a Mercedes Benz? " is important to us, you may share it by using the comment box below.